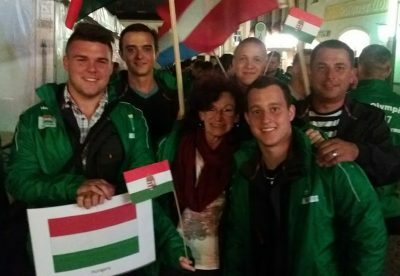 Ádám Majzik, Doma Maglic, István Bárány and Máté Menyhárt, senior students at the EUROPEA school FM KASZK Vácimező were presented with the great chance to travel to Burgstadt, Saxony (DE) for the 2nd AGROLYMPICS. Pic – Hungarians in Burgstadt, DE. And what do they say about the big event itself? “The atmosphere was absolutely fantastic all the way. The organisers did a wonderful job with the tasks and the social programmes too. The opening and the closing ceremony, and the party in the end were amazing.”- István reveals. “I surely enjoyed handling all those big machines.” – Máté says. “The tractor driving track was great fun. And as for me, I just loved reversing the 9m trailer, a real monster!”- István admits. “Balancing the bales – well, that was a challenge. But I was very good at it.”- says Ádám with a confident smile. “The competition was really great.” – Doma tells us.” I would love to go back and do it all over again!” And all the boys go along with that. The Hungarian team got to the 14th place in Germany sharing it with their Danish peers. The two teams had exactly the same score in the end! However, in some of the disciplines Ádám, Doma, István and Máté did really well: Apple pressing 2nd, Assembling a pipeline 4th, Handling potato boxes 4th, Hand milking 5th, Tractor driving 6th place. When asked about their best experience they agree that apart from the competition, meeting students from other countries was superb. “Sometimes it is really difficult to make yourself understood in a foreign language. But we made great friends with the Romanian and the Latvian team!” – Máte says.